That depends. 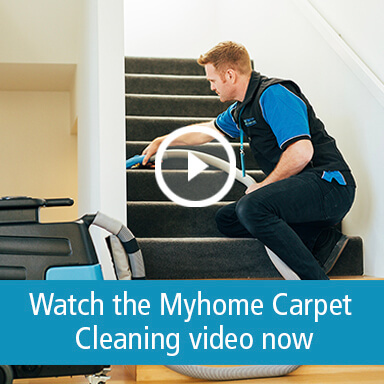 When you request a quote a Myhome representative will get in touch to make a viewing appointment. He or she will then take a quick look at your carpets and the clean required, then provide an on-the-spot quote. But don’t worry there’s no obligation. You can then have as much time as you want to think about it and get back to us. Once you give us the go-ahead we will schedule in a time to visit you to carry out the clean. It’s easy and convenient. You can pay by credit or debit card (which we treat in the strictest of security and confidentiality at all times) and we debit the amount off your card each after the clean has taken place. We will also provide a full invoice for your records. Again that depends. We don’t quote on time, we quote on the job. So, you will pay for the best carpet clean possible, irrespective of how long it takes. This gives you peace of mind that we won’t be clock watching and also puts the onus back on Myhome to get the job done properly and efficiently. Will my carpets end up very wet? No, the special Dri-Touch cleaning system we use leave your carpets virtually dry and ready to use in less than an hour. What’s more, as the system uses encapsulation technology, you’ll get unparalleled levels of cleaning, without the chemical residues or any harsh smells. Yes of course! Either click on our get a quote section and fill in your details or call us today on 13 22 31. We will then book a viewing appointment for your local manager. He or she will then take a quick look at the carpets you require cleaning, then provide an on-the-spot quote.